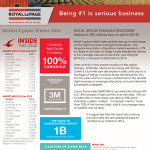 To view the Royal LePage Winter Newsletter click above. ROYAL LEPAGE NIAGARA REALTORS® Helped 6,032 clients buy or sell in 2015!! What A great Year!! Sales activity was up in most areas of the region as were average house prices. The Niagara Association of Realtors market reported a 17% increase in unit sales of Single Family Residential Homes & the average sale price rose 8.6%, now sitting at $274,321 compared to $252,546 for 2014. Sales activity in the western portion of the region Grimsby, Smithville, West Lincoln along with Stoney Creek & Dunnville saw decreases in sales units due to a shortage of listings, inventory levels remained low thru out the year which of course contributed to the double digit increases in average sale prices as buyer demand exceeded availability. Luxury home sales ($500,000 & up) were also strong with a 21.4% increase in sales activity over last year. The List to sales ratio in most areas was above 70% which indicates a sellers’ market. “In laymen’s terms” more than 70% of the homes listed, sold & the average days on Market was 53 days. It is expected that this trend will continue into 2016 and we are looking forward to another busy market in 2016.